Home / Banking jobs / Vacancy / Vacancy Announcement from Bank for Management Trainee and Junior Assistant. Vacancy Announcement from Bank for Management Trainee and Junior Assistant. This is a mid-level position in the Bank where one will be deputed to the Bank's various branches/areas anywhere in Nepal as per Bank's requirement. 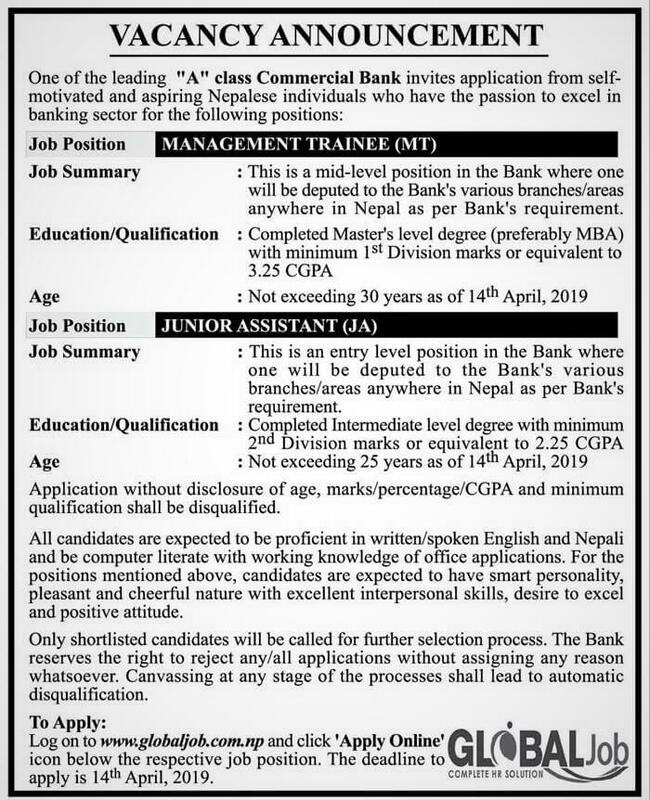 This is an entry-level position in the Bank where one will be deputed to the Bank's various branches/areas anywhere in Nepal as per Bank's requirement. Application without disclosure of age, marks/percentage/CGPA and minimum qualification shall be disqualified. Log on to www.globaljob.com.np and click 'Apply Online' below the respective job position.